Once again, I would like to welcome a high profile sports star “coming out” publicly that he is homosexual. I have a blogged before about how important it is to have role models that are openly gay. 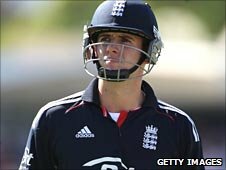 Steven Davies is the only openly gay cricketer. His decision to announce his sexuality publicly remains an incredibly brave move in an industry that is still hostile to issues of sexuality, especially in relation to sponsors. As Steven commented himself though, “If I can just help one person to deal with their sexuality then that’s all I care about”. I am convinced that his decision will do just that.